How mighty they are, those hymns and those antiphons of the Easter office! Gregorian chant that should, by rights, be monotonous, because it has absolutely none of the tricks of modern music, is full of a variety infinitely rich because it is subtle and spiritual and deep... Those Easter "alleluias", without leaving the narrow range prescribed by the eight Gregorian modes, have discovered color and warmth and meaning and gladness that no other music possesses - Thomas Merton, The Seven Storey Mountain. But Thomas Merton was no reactionary. In 1966 Joan Baez visited him at his Trappist monastery at Gethsemani, Kentucky and they drunk beer together (Trappist I hope) and discussed sixties music. He was also a great fan of Bob Dylan and played Dylan's records in his hermitage (the Trappists are a silent order! ), while Merton's poetry was influenced by the folksingers' lyrics. Thomas Merton shared many of the values of the sixties counterculture, particularly non-violence and opposition to the Vietnam War. 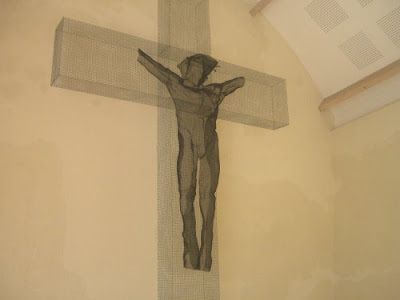 My header photo shows David Begbie's thoroughly modern Crucifixion, and I took it in the Barn Chapel at the Anglican Shrine, Walsingham, Norfolk. Now read about new music with a Benedictine habit.